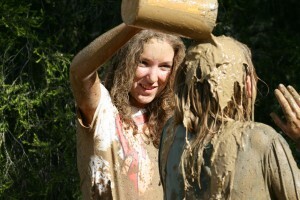 In 2009 at the World Forum for Early Childhood Care and Education in Belfast, the idea of International Mud Day had its beginnings. Two members of the Nature Action Collaborative for Children, Gillian McAuliffe from Western Australia and Bishnu Bhatta from Nepal discussed the challenges children faced when playing in the mud in each other’s context. Gillian reflected on the lack of mud as Perth is situated on a sandy plain and also the reluctance of the culture to ‘get dirty.’ Bishnu, on the other hand, had lots of mud but many children did not have enough clothes to be able to get them dirty or soap to wash them. On her return to Australia, Gillian who at the time was the Director of Teaching and Learning at Bold Park Community School (BPCS), told this story to a group of seven and eight year olds. The children from BPCS decided they could send clothes to the children in Nepal so that they could play in the mud. They raised $1000 in three weeks and sent it to Bishnu to buy some clothes for some children there. So in September 2009 Bishnu did this and arranged a special day for the children of the Panchkhal orphanage, which included their first meat meal in five months. Since then the two groups have celebrated a very special bond and played in the mud together, although in different countries. 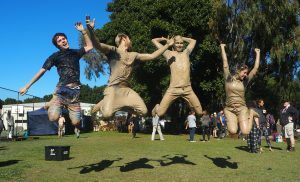 Four years later, in 2013, a group of six families from BPCS travelled to Nepal to take part in Mud Day celebrations with the children of Nepal. They also raised money to complete a renovation project at the orphanage. At last, they were able to play in the mud together in the same country. In 2015 BPCS held ‘Mud Month’. Throughout the month of June, the BPCS community engaged in many and varied ‘mud’ activities giving our children the opportunity to ‘connect to the earth’.